The set includes a beautiful blown glass decanter, stainless steel sediment filter and patented double wall glass aerator. 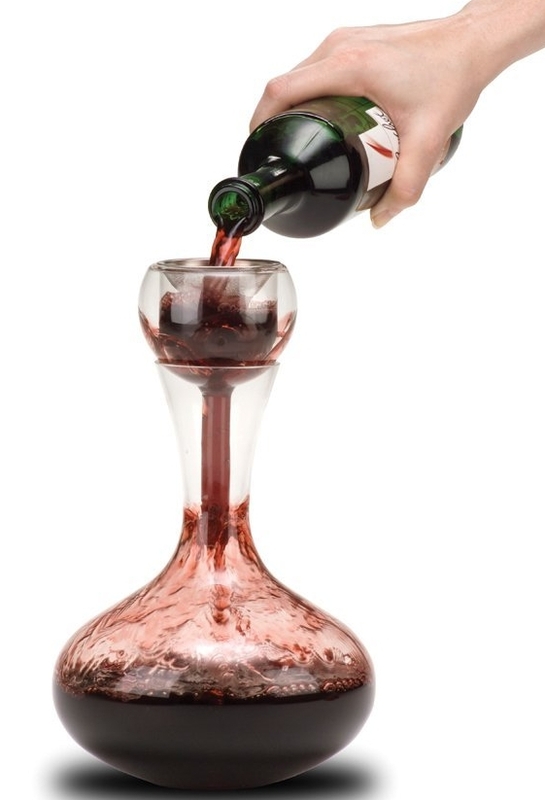 Aerating wine has a proven benefit; simply exposing your wine to oxygen will improve its taste and aroma. A very important step in making sure your wine is served at its best. Phase one of the this three step process begins by pouring the wine through the stainless steel filter, catching sediment then disbursing through the first of the double wall aerator. In phase two the wine is gently disbursed again, this time into the sides of a specially designed globe providing a totally new aeration process never possible before. In phase three the wine continues into the final enhancer and travels strategically out onto the side of the decanter at a rate determined to provide superior aeration and oxygenation.